In the body, L-tryptophan is catabolized by an enzyme called Indoleamine 2,3-dioxygenase (IDO) to form a class of molecules known as kynurenines. These compounds have been shown to be immunosuppresive, preventing inflammation and T-cell mobilization. Additionally, depletion of cellular stores of L-tryptophan also appears to induce down-regulation of the immune response. What does this have to do with cancer immunotherapy? Interestingly, cancer actively hijacks the IDO pathway to promote immune system suppression and tolerance to tumor cell antigens by overexpressing IDO in the tumor, at host cells in the immediate area of the tumor, and at tumor-draining lymph nodes where T-cells could normally become activated against tumor antigens. Think of it like a beekeeper using smoke to keep the bees calm as the keeper removes honey from the hive. By upregulating the expression and activity of the IDO pathway, tumors effectively “hide” from the immune system while they grow out of control in the host tissue. But this exploitation of the body’s own immune regulation by cancer also presents a weakness that can leveraged in the fight against tumor progression. 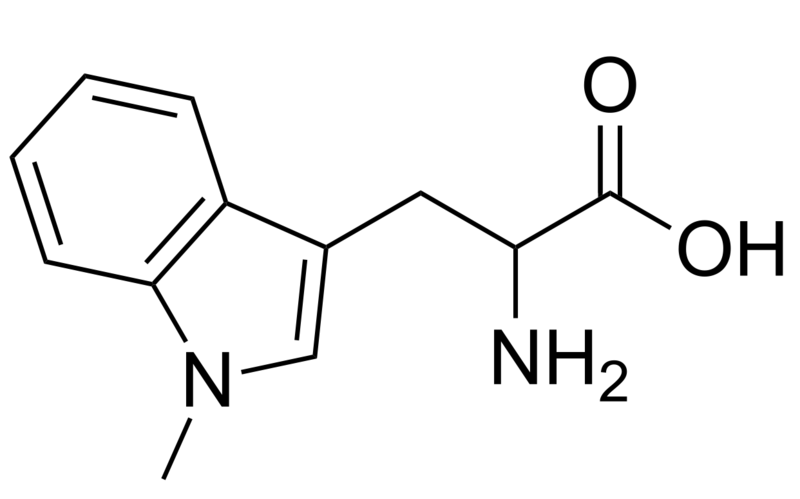 Enter 1-methyl-DL-tryptophan (1MT), pictured above. 1MT is known to be an inhibitor of IDO that works presumably by mimicking the natural substrate (although I believe this has not been shown explicitly). IDO inhibition by 1MT has been shown to work in combination with chemotherapy approaches to limit tumor progression in mouse models. Adding 1MT to chemotherapy treatments allows the host immune system to mediate a response to the tumor cells, especially in the presence of dying tumor cells undergoing apoptosis and releasing antigen. By taking away tumor-induced immune tolerance, 1MT inhibition of IDO allows the T-cell system to recognize, attack and destroy cancer cells in synergy with chemotherapy. Early clinical trials involving 1MT appear to be ongoing, with work being done by NewLink Genetics in Ames, IA.